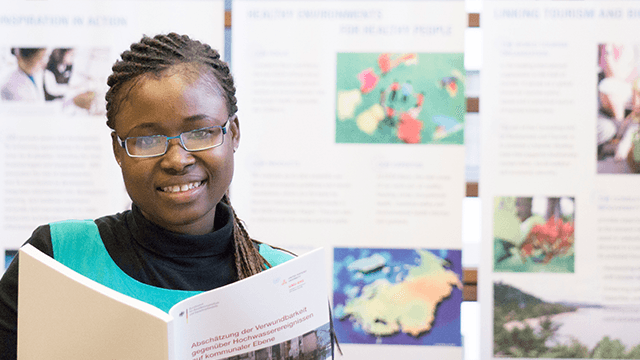 As part of the Joint MSc Programme “Geography of Environmental Risks and Human Security”, the second year Master’s students took part in a week-long seminar at the Academy for Crisis Management, Emergency Planning and Civil Protection (AKNZ)* in Bad Neuenahr-Ahrweiler, Germany. The Academy is the central education and training institution of the German Federal Office of Civil Protection and Disaster Assistance (BBK)**. There, the students were introduced to various aspects of civil protection. Civil protection can be defined as the range of emergency measures to be taken by an organized body of civilian volunteers for the protection of life and property in the event of natural disaster or enemy attack. A major component of the seminar consisted of a table-top exercise. A table-top exercise is an educational activity in which students or personnel are assigned emergency management roles and responsibilities and gather to discuss, in a non-threatening environment, various simulated emergency situations. The Master’s students were given the responsibility of coordinating disaster management in the context of flooding in Pakistan. Mary Asare-Addo, a second year student from Ghana speaks about her experiences. What was your role in the table-top exercise? The table-top simulation involved role-play in the setting of an On-Site Operations Coordination Centre (OSOCC). An OSOCC is the area designated in the immediate aftermath of a disaster to provide a platform for emergency response coordination in the affected country. We were assigned various roles and given problems to solve. My role in the exercise was operations officer. My mandate was to ensure that all relief items were deployed to the areas that needed them, by coordinating with the logistics team. I was primarily in charge of setting up the Arrival and Departure Centre at the airport, to receive aid, register donor organizations and allocate them to the appropriate cluster groups according to their mandates and capabilities. What was the most challenging part of the exercise? One of most difficult aspects was the issue of transportation. During a disaster there are often no accessible roads. Knowing the areas which are safe for personnel to enter is also a major consideration. During the simulation, this involved meeting with the Pakistani government and analyzing hazard maps to identify areas which were dangerous to travel to. You also have to be culturally aware and have to coordinate with the government and authorities in the affected country. You are there to offer assistance, you cannot just go in and do what you want to do. What are the most valuable lessons you will you take with you from this seminar? The main lesson I took away was the power of teamwork. We learned a lot, working with different people. We are all from different backgrounds and have a different way of doing things. It was just a simulation, but we assumed the various roles as though it were real life. We did our best and came out successful in the end. How has the seminar changed your understanding of civil protection and disaster management? With German civil protection in particular, I realized that people are actually doing something. It’s not just on paper. I see the work that goes on behind the scenes, everything that has to be put in place. What really excites me about the German system is the power that is given at the local level. To a certain extent, the local level appears immune to external political influences. What do you think is the most challenging aspect of civil protection? I would say safety and security in general. We look at both safety and security as being the responsibility of the government. There are measures the government puts in place to ensure the security of citizens. However, I learned during the seminar that actually you are also supposed to take your own steps to ensure your own safety. As it was pointed out during the seminar, nobody is safe nowadays. You have to take responsibility, as well as using the system put in place by authorities. How does civil protection in Germany compare to civil protection in your country? In Ghana, we use a centralized form of government where issues of civil protection are not dealt with at the local level. The local level is managed by the government authorities. What I find very interesting about Germany, in comparison to Ghana, is the willingness of the Germans to do voluntary service. At the Federal Agency for Technical Relief (THW) (Bundesanstalt Technisches Hilfswerk), a civil protection agency under the German federal government, 99% of its members are volunteers. It shows they have a sense of ownership, protecting each other and they do it without money. How does the course itself feed into your future career plans? I would love to be a disaster risk manager. I have been trying to decide between working in disaster risk management or in development, but either way, I would like to be involved in humanitarian assistance in some manner. I would really like to work for the United Nations Development Programme (UNDP), the UN Office for the Coordination of Humanitarian Affairs (UNOCHA) or another disaster management agency. For that kind of work you have to be available to travel anywhere. The UNDAC system has teams which it can deploy on short notice to various destinations. I would be willing to work anywhere in the world.